I’ve been in Canada since Friday. Gotta say it’s been great to be back. I’m always so happy to cross the border, probably because coming here remains the decision that changed my life the greatest. Marrying Bruce, immigrating here, reestablishing my career, and choosing to become a Canadian, are the smartest decisions I’ve ever made. The trip started exactly as planned: relaxing, pampering, reading. We flew to Toronto with a old friend, had coffee with a newish friend and had a wonderful time with a group of friends we wish we could see more often. But we started planning Bruce’s next big birthday so perhaps we’ll all be spending quality time together in December 2014. Last night was Bruce’s niece Amanda’s wedding. 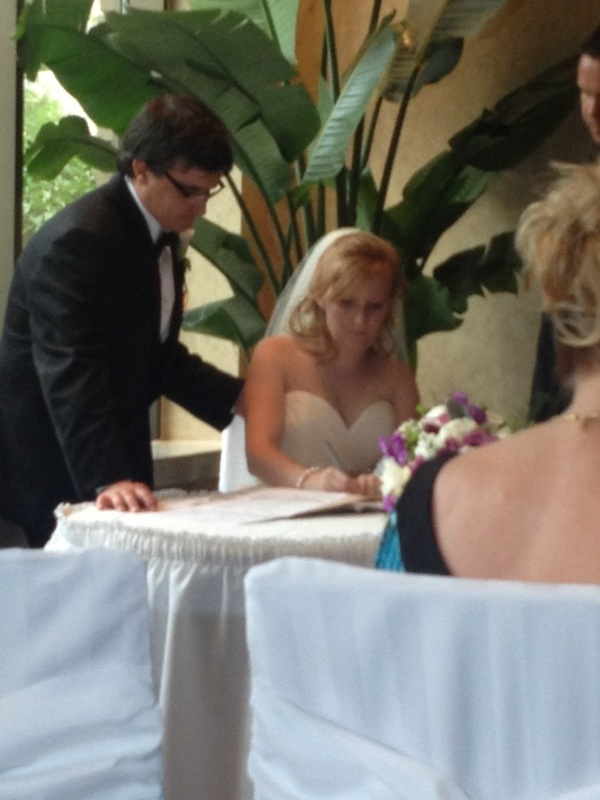 Of course she looked beautiful and we are all so excited to have Marc in the family, not just because he’s a winemaker. A great party! And it was great to catch up with Bruce’s family and have something exciting to celebrate. Tonight we’ll all gather for some pizza and wings and hang out some more. It’s been a lovely trip. But now if you’ll excuse me, I’m going to head to The Beer Store and LCBO for supplies. And pick up some Canada Day decorations. This entry was posted in So and tagged Canada, Canada day, family, LCBO, nostalgia, the beer store, wedding. Bookmark the permalink. I don’t think I had realised you weren’t originally Canadian! It’s true. I have only been Canadian since I was 31.